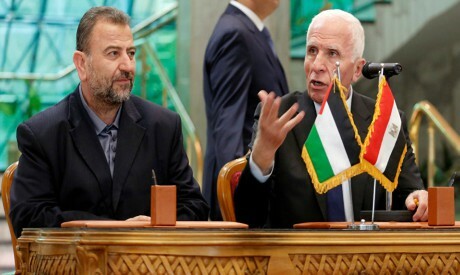 A meeting between Hamas and Fatah representatives within the framework of reconciliation efforts scheduled this week in Cairo was postponed for several days in the hope of bridging differences between the two sides. According to informed sources in Cairo, both sides responded positively to the latest Egyptian reconciliation paper but remain in dispute over matters not addressed in the proposal. What this suggests is that they are at odds over whether the truce with Israel or the reconciliation process should take priority. Palestine Liberation Organisation (PLO) Executive Committee member Azzam Al-Ahmed, head of the Fatah reconciliation delegation, announced on Monday that the delegation had delivered a positive response to Egypt’s reconciliation paper. “Fatah based its response on the 2011 and 2017 agreements and their executive mechanisms,” he said. The most significant part of Al-Ahmed’s statement on Monday concerned what he described as the “political framework”. According to sources in Cairo, Fatah insists that Hamas must come to Cairo to sign the Egyptian paper first. Then the Palestinian Authority, in its capacity as the legitimate representative of the Palestinian people, will sign the truce agreement with Israel. Sources say the Egyptian paper is not the crux of the problem at present and differences over the reconciliation process focus on relatively minor details. The real problem is that tensions have begun to mount between the two sides and this is reflected in their political postures and in the rhetoric of their respective media. The PA maintains that Hamas now links the reconciliation process to the truce it recently struck with Israel which, Fatah spokesman Osama Al-Qawasmi told the press, “means Hamas gives the truce with Israel priority over the reconciliation, with the aim of voiding the reconciliation of any substance”. He also claimed Hamas is working to implement the deal of the century which calls for “the creation of a Palestinian state in Gaza”. He stressed that Hamas was one with the national consensus among Palestinian factions over the need to lift the blockade against Gaza, to confront the deal of the century and safeguard Palestinian rights. A source close to Hamas, speaking to Al-Ahram Weekly from Gaza, said that while Hamas needed to achieve progress on the truce and the lifting of the blockade so as to score political points in advance of the general elections which will culminate the reconciliation process, this did not signify that it was any less eager to conclude the reconciliation. According to this source, Fatah is obstructing the reconciliation by insisting Hamas comes to Egypt to sign the Cairo paper and by rejecting the inclusion of four factions from Gaza — the People’s Resistance Movement, the Peoples Resistance Committees, the Mujahideen Movement and the Ahrar Movement — on the grounds that they are not part of the PLO. This stance reflects Fatah’s determination to identify itself as the Palestinian Authority rather than as another faction, he said. The Palestinian Authority, for its part, insists that one of its integral functions is the conclusion of the reconciliation process, and that neither Hamas nor any other faction has the right to assume such a task independently. Speaking to the press, Al-Ahmed described the truce as “a national act, 100 per cent”, but stressed that it is not the responsibility of Hamas, Fatah or any other of the other factions that went to Cairo. He stressed that the reconciliation must take priority, although this did not mean that the truce should be deferred. “We hope this [the PA’s signing of the truce] takes place immediately after the announcement of the end of the rift and with the beginning of practical steps to end this abhorrent page” in Palestinian history, he said. A Fatah source told the Weekly that the movement is in the process of drawing up an emergency plan for dealing with Gaza in the event that Fatah and Hamas fail to overcome their differences and reach an agreement. The Palestinian reconciliation drive made significant progress from October 2017 to March 2018. However, it broke down after a roadside bomb struck the convoy of Palestinian Prime Minister Rami Hamdallah and head of intelligence Majed Faraj just after it entered Gaza from the Erez crossing in March. It has yet to be determined who was behind the assassination attempt. Cairo remains keen to end the more than decade-long Palestinian rift although local sources say there are no guarantees that the factions will carry out the steps necessary for reconciliation to become a reality.